Get started with your career as real estate appraiser with helpful tips, information and requirements! Welcome to Appraiser Career Center! Congratulations on your interest in a career as a real estate appraiser! You are considering an exclusive and rewarding field of work where you provide a valuable and necessary service in the real estate industry. And you can be your own boss! The minimum requirements to become a real estate appraiser are established by the Appraiser Qualification Board (AQB) and are adopted by all 50 states – consisting mainly of field hours, coursework and other educational requirements. The requirements for lowest licensing licensing level are mostly uniform across all 50 states. However, some states impose greater requirements such as longer experience hour requirements and a longer minimum time to obtain those hours. There are few state exceptions to the requirements for certification – most states do not add anything additional as set forth by the AQB. Click your state below to view the requirements and quickly get started! Interested in Appraising? 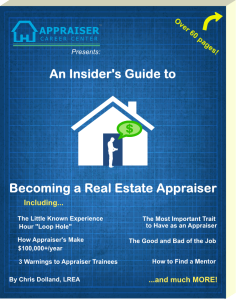 Check out the Ultimate Appraiser Career Guide! Generally, your job as a real estate appraiser is to provide an opinion of market value for real property. You will be hired by a variety of clients for a number of purposes, but mostly for home purchase and refinance transactions – residential, that is. However, with the right education, experience and license credentials you can appraise commercial property – such as office and apartment buildings – as well! Want to know more? Click one of the licensing levels at the top of this page to get started. Or check out one of the articles below!